Our Jakarta business hotels review with a simple shopping guide and some taxi and fast-bike tips for the city's epic traffic jams. Uncommonly clear skies looking past the iconic blue-tip 262m BNI City Tower also known as Wisma 46 on Sudirman avenue. The tower has been a landmark since 1996. Much of Jakarta remains low-rise with red-tile roofs. MY TAXI driver leaned on the horn - I had impressed upon him the urgency of my appointment - and then pulled over sharply, in the middle of the road. Without a backward glance at me he leaped out and waddled off into a park as the traffic milled about, becalmed, while curious bike passengers in bright helmets peered at the empty driver's seat and at me. He returned after a while, seemingly relieved. The traffic hadn't moved an inch. This is how business travellers will negotiate Jakarta's legendary gridlock, prepared for any eventuality. Being late is normal but do try and factor it all in so you are just a wee bit late at worst. One way to beat the traffic is to have your guests meet at your hotel. Or pick your location carefully. Jakarta undoubtedly gets a bad rap for its traffic snarls that rival Bangkok, concerns about terrorism – brought into focus by the 17 July 2009 blasts at the Ritz-Carlton Mega Kuningan and JW Marriott – political ups and downs, and chronic pollution. It doesn't always make for cheery reading. But life ticks along in Indonesia's capital. The city has been cleaned up, bus lanes are being created, innovative transport options are sprouting, and business is in rude health with construction sites everywhere and fancy hotels opening their doors each year. Gleaming office blocks are in blunt contrast to slums but, still, the city has a charm all of its own – people are warm, friendly and chatty, and there are lush pockets of green, with much of the city comprised of small tile-roof homes that appear as a sea of patchwork red as your flight comes in to land. It may not seem a muscle metropolis from 3,000ft but it most certainly is. There are millions of people in Jakarta – around ten million at last count. Needless to say, it’s busy with all these heaving bodies. Some of the bigger hotels offer so many facilities that it is possible to do all your business, exercise, shopping, eating and clubbing (yes, despite its seemingly sober image, Jakarta is home to some of the liveliest nightlife and dance spots in Asia) in one very big and comfortable space. Top hotels in Jakarta are havens in the midst of the bustle. And some of them are luxurious escapes indeed. Many in mixed-use developments connect conveniently to office blocks and super-swank Jakarta shopping malls, making it easy (but not necessarily cheap) to pick up a couple of Indonesian souvenirs, or that Louis Vuitton case. International fashion brands are easily found and boldly advertised, keeping shopping addicts well entertained. There are dozens of golf courses too, so there's plenty of opportunity to do business on the greens. Be aware of security though. It is tight everywhere. Searches of cars, bags, bodies are common – don’t fret, it’s all in the name of safety. Just smile at the sniffer dogs and wear clean underwear. Jakarta International Airport (Soekarno-Hatta) International (named after first President Soekarno and first Vice President Hatta) is 20km west of the city, and is relatively easy to navigate. There are three terminals. T1 is the domestic terminal, T2 is international and you'll likely arrive here, unless you fly in on Garuda to the sleek and modern Terminal 3 where its planes dock almost exclusively. At the old-fashioned Terminal 2 - where you walk through glass-wall corridors viewing trees and greens - it is possible to get from your arrival gate through immigration and into a taxi in 10 minutes flat. This is no exaggeration though at times when several flights come in, the situation will be different. There is not much walking. Since there is no need for arrival or departure cards at Jakarta International Airport, immigration queues move fast and the small concourse clears quickly. Customs is fast as well unless you have mountains of bags that may be diverted to an x-ray machine. There are money changers after customs. Many hotels offer airport transfers (for quite a substantial sum) but metered taxis are a good option to get into the city. The best and most reliable taxi company in Jakarta is the Blue Bird Group (tel: [62-21] 798-1001, 7917-1234, www.bluebirdgroup.com). The company operates Blue Bird Taxis (blue Toyotas with various logos on the door) with the flagfall at Rp6,500 and the more expensive Silver Bird Executive Taxis (usually a black Mercedes) where the flagfall is 16,000. For even more exclusivity, there is also a Golden Bird fleet. A Silver Bird will fly you into the centre of Jakarta in about 45 minutes and a Blue Bird will get you to The Dharmawangsa Hotel in South Jakarta also in 40-50 minutes for Rp175,000 (US$13 or so, including the airport surcharge and toll fee). The exchange rate is roughly US$1 = 13,500 Indonesia rupiah. If the traffic is unkind the same journeys could take twice as long or more. Keep that in mind. At the airport you'll also find regular taxis lined up. The Limobikes popular a decade ago have made way for zesty Go-Jek (www.go-jek.com/) bikes, and cars, and newer entrants include Uber (www.uber.com) cars and bikes. Expres Taxis (expressgroup.co.id) with a range of fleets and prices is another option. Apps are available for smartphone users. 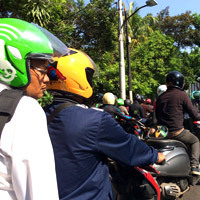 Starting out in 2010 as a small Jakarta motorbike call centre, Go-Jek was valued at a staggering US$3 billion by 2017 with its own bikes and cars operating across Indonesia. In addition to Go-Ride, Go-Car and Go-Food, the company also runs Go-Med, Go-Pay (an electronic payment system), Go-Points (a clever point system for frequent users) and even Go-Massage! What all this means is you can book Go-Ride and hop on a bike without the hassle of cash and should you pay in large bills you have the option of storing value in your Go-Pay account instead of demanding change back. It's a seamless solution to Jakarta's epic traffic. Departing Jakarta International Airport involves several x-rays and security checks including, for some airtlines, another manual pat down and bag inspection at the gate. T2 is small and limited in its duty-free shopping but you can pick up a one litre bottle of Johnnie Walker Black Label (12 years) for about US$44, with a 12-year-old Chivas one litre also at US$44. Johhnie Walker Blue Label appears to be the whiskey of choice here and is constantly out of stock with prices whimsically quoted at anywhere between US$200 and US$280 for a litre bottle. For ladies, a BVLGARI Rose Goldea 90ml EDP will set you back about US$140. 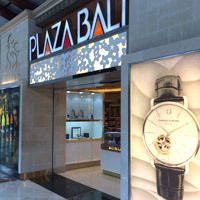 There are a few small duty free shopping outlets at Jakarta airport but the biggest is perhaps from Plaza Bali. Books are cheap and WH Smith and Periplus are on hand though the former is more a convenience store at T2. The airport air-conditioning is on the low side though at the airline gates you'll find cooler climes again. And for food or coffee there's Starbucks, Luccini Cafe (with free WiFi), and the larger better set up Old Town White Coffee. So where are the hotels? 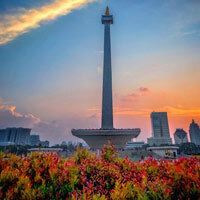 Jakarta is huge, so it’s best to find out where you’ll be doing most of your business and pick a hotel accordingly. The airport is to the west, and Jakarta’s port is to the north. The true centre of the city is Merdeka Square, holding the National Monument, a tall gold-tipped spire around which traffic seethes at rush hour. The Presidential Palace is next to Merdeka Square. Jakarta is so vast that there are a number of areas that are mini-centres on their own. Jalan Thamrin connecting with Jalan Sudirman farther south is the main road through the city. 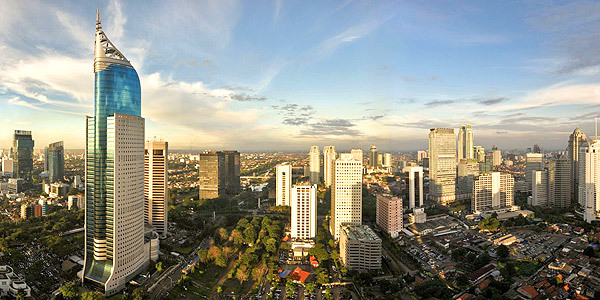 Perhaps most important for business travellers is the area south of Merdeka Square. Named the Golden Triangle, it is home to the city’s major banks, multinational businesses, superior hotels, shiny shopping malls, foreign embassies, and is considered to be Jakarta’s central business district. On to our Jakarta business hotels review. A fitting place to start is at the tip of the Golden Triangle, at Bundaran HI, a large and active fountain at the roundabout where Jalan Thamrin joins Jalan Sudirman. Four hotels stand proudly, or forlornly, depending on the traffic, at each corner. Take your pick. The ‘youngest’ kid at this circular hotel epicentre is Hotel Indonesia Kempinski Jakarta (www.kempinski.com). Of course it’s not the newest, but rather the latest incarnation of one of Jakarta’s landmark addresses – having gone through Sheraton and InterCon already. The original Hotel Indonesia was officially opened in 1962 by the former President Soekarno and was hive of government activity in rather musty surrounds (much of the hotel was not air-conditioned for a long while). The hotel is only one part of a huge complex that includes the Kempinski Private Residences, an office tower and the cavernous Grand Indonesia Shopping Town with 209 shops and 124 restaurants at last count. Find everything here from Adidas and the excellent Kinokuniya bookstore to brands like COACH, Cotton On, DC Comics, Forever 21, H&M, MUJI, Marks & Spencer, Zara and UNIQLO. It’s quite a mix if you’re on a Jakarta shopping spree intent on hunting for value. This is a far cry from the slow paced Sarinah stores selling Indonesian wares from woven songket fabric to gourmet coffee beans. Hotel Indonesia Kempinski has kept its original exterior, but has been fully revamped on the inside with black stone and marble slathered liberally in clean-cut straight-line spaces with crimson flowers offering a burst of counterpoint in the modern glass-walled lobby. It has also cut down its former bulk of 450 rooms to just 289 with a bit more stretch space. While the hotel attracts younger luxury hipsters and business travellers, you may likely be in town for a conference and this is something Hotel Indonesia handles with aplomb. There are two spacious ballrooms and 13 meeting rooms offering a range of venues for everything from small corporate meetings in Jakarta to MICE events (despite the smaller room count), weddings, and assorted galas. The rooms are found in two adjacent L-shaped low-rise buildings, one of them housing the Executive Club rooms. A 35sq m Deluxe is kitted out in a contemporary look with a dark wood foyer, and subtle Indonesian touches – like the purple-grey batik design carpet – plus a plump bed set against a beige fabric head wall and looking at the 42-inch flat-screen TV as well as the bathtub through a glass partition with blinds. Technology has been smartly ramped up with complimentary WiFi, iPod docks, pipe reading lights, and pullout bedside room controls (with three-pin electric sockets being introduced). A glass desk with curved corners is set near the window with a white leather chair. The in-room lines are more curved and softer than at the lobby, with blown-glass lamps, plaster carved ceiling skirting, high-back chairs and the patterned carpet. Small paintings on the walls create a homey feel. A huge bathtub is on hand for weary bodies along with a marbled basin, a rain shower cubicle, and a Japanese electronic potty to pamper your derriere. Also find a flat laptop-friendly safe. An iron is not available in-room but can be had upon request. A 45sq m Grand Deluxe is roomy with a half-moon sofa and scalloped white soaking with an LCD television for news or entertainment while the suds work their magic. The tub has a city view as well with blinds for privacy. Workouts are available at the fitness centre while Kempinski The Spa is open 8am to 11pm with a range of wellness therapies starting from a very affordable US$28. Take a dip in the pool with fine views over Jakarta’s urban sprawl. Restaurants include a Paulaner Brauhaus, the Kempi Deli, Signatures Restaurant, a pool café, the lobby lounge with its strikingly lit yellow alabaster bar, and the Japanese OKU (in a separate wing). As at other top Kempinski's expect a terrific breakfast with a large bread selection. The Keraton at The Plaza, a Luxury Collection Hotel, Jakarta (opened 2012, www.keratonattheplazajakarta.com) is a mouthful for even the most linguistically dexterous but it is excellently positioned for both leisure and business travellers, joined at the hip to Plaza Indonesia, a bustling mega Jakarta shopping mall bursting with restaurants and designer brand goodies from Louis Vuitton, Tiffany, Vilebrequin and Chanel to Diana von Furstenberg, DKNY, Charles & Keith and Marks & Spencer. Find everything here from Starbucks to steaks for calories and caffeine on the fly. At The Keraton, expect complimentary WiFi and unrelentingly contemporary minimalism in the soaring fluted steel and glass lobby with metal filigree partitions offset by bright floral creations. It is very welcoming of light that plays on the grey and black décor and blonde wood panels. The pace is brisk and service is responsive. As you move to the lift lobby the shade turns to black. Black and white zigzag pattern carpets lead to tall grey doors that open onto 70sq m rooms (standard 64sq m). Pale wood floors, also set diagonally, lead past mirrored walls to a wraparound window that encloses the huge bedroom with the bed facing the sky and a 42-inch flat-screen television perched on a light wood cabinet (with Blu-ray DVD player) next to a leather armchair. The black work desk is all glass with an elegantly white all-leather chair. Find two three-pin plug sockets, a Bose speaker socket and a 25-inch LCD Samsung desk TV with a PC hook-up. The lemon alabaster bedside cabinets are attractive, set against a bleached wood head wall. The look is ultra-mod with clean lines. Expect press-button controls, a pillow menu, an embroidered gold bed runner, laptop-size safe, coffee machine, and a walk-in dresser leading to the bathroom with twin vanities, white marble, oval soaking tub and large rain shower cubicle with seat. The views in all directions run forever and, even in the heart of downtown, you’ll see a sea of red-tile roofs and splotches of green stretching to the horizon. The seventh floor is where you’ll find a restaurant and an indoor fish-tank pool with glass sides (the outdoor pool alas is for residence guests only). The spa is at Level 6. The 140-room hotel runs up to the 22nd floor while the residences occupy the floors from Level 23 to 51. This is a sprightly brisk-stepping addition to the older but steadily upgrading legacy hotels arrayed around the traffic-choked Hotel Indonesia Roundabout (also called the HI Circle). The Keraton at The Plaza is making ripples and fares very well on our best Jakarta business hotels review. Add to this, butlers and The Luxury Collection Concierge and you have a splendid address for work or play. Also linked to shopper-mad Plaza Indonesia (which rates highly in our Jakarta shopping guide) at various levels and with robust security at its elevated front entrance is the Grand Hyatt Jakarta (jakarta.grand.hyatt.com). If you can’t be bothered walking a few steps to the mall, just stop by Hermes in the lobby of the Grand Hyatt and watch your wallet empty. It is one of the hotels that stirred things up over two decades ago and defined business travel in this city. It is gleaming, polished and well maintained with pairs of maintenance workers constantly on the prowl attending to paint retouches or carpet fixes. The lobby entrance, while massive, with its vertiginous pillars, is devoid of a central focus and at first sight gives the impression of walking into the jaws some enormous petrified marble beast. It appears entirely designed to keep traffic moving along the concourse and up two mulishly slow escalators (that grudgingly up the tempo, but only modestly, as you step on them) and cascading zigzag marble stairs leading to the reception level where things suddenly fall into place with fast-stepping ladies in de rigueur Grand Hyatt black. A tall blonde in a fitted tailored grey dress breezes by with a roller bag, cheek pressed to an iPhone, while three Asian IT professionals (from the look of things) amble by in awkwardly tight black suits and laundered white sneakers. Spot beefy slow drawling Americans, stylish slicked-hair Europeans and ponderous Arabs in the mix. 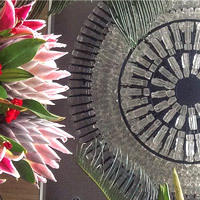 The renovated Fountain Lounge that returned June 2017 (with power sockets under several marble-clad tables) offers breezy views – over fronds of traveller palms – of the 5-star competition encircling the HI roundabout. The Grand Hyatt has an unrivalled, or dangerously imperilled, location, depending on your point of view and the state of gridlock in the city’s legendary traffic jams. None of this deters the business set for whom the hotel has built a rock-solid marque for service standards and corporate meetings. The Grand Café with its sumptuous breakfasts gets a new look in 2018 as the hotel’s 427 rooms undergo a facelift around Q4 on. Rooms and suites are well turned out for the business traveller with a no-nonsense, minimalist, masculine touch. A marble entranceway leads to a good-sized bedroom with flat-screen TVs, and large desks. WiFi is complimentary. Bathrooms are in marble with a separate bath and shower. Club Rooms offer benefits like access to the Grand Club lounge. An attractive pool area with gazebos offers respite from the bustle, and there are several restaurants and bars for all tastes. A Grand Ballroom on Level 2 is on hand with adjacent meetings rooms for everything from muscle MICE events and large corporate conferences to small CEO meetings. But what sets this hotel apart as a top address for Jakarta corporate meetings is the The Residence ONFIVE, with four spacious meetings rooms in a residential format with large uncluttered sofa arrangements and wall-to-wall wooden cabinets with books and artefacts. Natural daylight streaming in is another plus. Mandarin Oriental, Jakarta (www.mandarinoriental.com) is the other five-star property looking out over the busy roundabout. It underwent a full renovation after a 2007 closure and reopened in 2009 with more, if understated, marbled panache, befitting an address in this coveted business zone on Jalan MH Thamrin smack next to banks and top multinational companies. The current 272-room count is lower than the earlier inventory and this has enabled a subtle living space expansion. A separate 3rd floor 590sq m ballroom has independent access and can host 600 people theatre style. There are additionally four meeting rooms and three areas for events with the entire meetings space amounting to a substantial 1,000sq m.
A generously apportioned 43sq m Deluxe Room offers a marble-floor foyer with dark wood walls and cabinets as well as a see-through bathroom glass partition. The bedroom has a textured carpet underfoot with several homey touches like the large lampshades at either side of the bed, the blue ceramic tea set and cups, the classic clock with hour and minute hands, and various artefacts in the cabinets with pin lights setting them off. The Elsafe is the old giant vertical box variety and your mother-in-law could easily be accommodated here guaranteeing utmost privacy. If she declines, the secure space is a snap for laptops, large SLR cameras and jewellery. One three-pin electric socket is available at either side of the bed while two more are installed in the dataport at the desk with its smart ergonomic chair so there’s no bother with charging electronic devices. WiFi is free. An iron is available to winkle out creases in the walk-in dresser en route to the grey marble bathroom that serves up twin vanities, bright mirrors, a tub, a rainshower cubicle (with hand shower too), and a small ladies’ dressing table with an illuminated-rim vanity mirror. It is not too compact and quite functional. A 64sq m Premier Executive has a more open feel with a square living area, a spacious cream marble toilet with two entrances and slatted blinds opening up views of the bedroom, bright cobalt blue cushions, silk bed runners and two TVs. Corner room Superiors are popular and better value for those battling accountants. Despite lacking floor-to-ceiling windows – as is the case at many older properties – the rooms with their smart black trim and dark woody overtones enjoy surprisingly abundant natural light, in part because the building is not closely overshadowed by other structures. The Li Feng Cantonese restaurant is a must-try with its etched glass maps of the voyages of Matteo Ricci, the seventeenth century Italian explorer, and a sea-green crystal shard ‘sea’ running along the ceiling. Design distractions aside, the restaurant will win kudos for its delicious ‘black swan dumplings with duck meat’ – served on a ‘cloud’ of smoke – and the spicy Szechuan beef. Regulars will enjoy The Mandarin Cake Shop, MO Bar, and the French Lyon. Later, burn off calories at the fitness centre or at the alfresco timber-patio pool with open views. The fourth player at this central circle (just opposite Grand Hyatt) is the rather bland Pullman Jakarta Indonesia (www.pullmanjakartaindonesia.com), with Grand Deluxe Rooms and Suites with free WiFi, 40-inch flat-screen hi-def TV, open views and acces to the Executive Lounge. In an earlier incarnation, this was the even more characterless Japanese-run Hotel Nikko. The property switched hands in 2013. Rooms are unremarkable but feature design flourishes and are more than adequate for any business traveller on the go. The hotel also serves up Fit and Spa which, as the name indicates, is a fitness and spa area with the added attraction of an outdoor swimming pool. The gym is open 24 hours. The gleaming reflective glass Pullman Jakarta Central Park (www.pullmanjakartacentralpark.com) in West Jakarta is a more appetising pick about a 20-minute run downtown when the traffic is amenable. It offers 317 rooms, including 55 suites, while Pullman signature rooms on higher floors offer generous views through floor-to-ceiling windows with flat-screen televisions, WiFi, and the Central Park Mall next door for shopaholics. A short way south off Jalan Sudirman is Shangri-La Hotel, Jakarta (www.shangri-la.com). It’s a bit farther from the shopping malls, but is next door to office towers that house some of the big local banks as well as companies like Citibank and Exxon Mobile. A circular driveway leads up to the hotel entrance, transporting guests slowly away from the gridlock and fumes just across from a train station. This address features a blazing white exterior with metal detectors and sniffer dogs at the entrance just waiting to get a whiff of your underwear. Shangri-La may be surrounded by urban development, but the grounds are expansive and the gardens lovely, creating a substantial oasis set away from the din outside. There are 662 rooms with superb views across the hotel’s large alfresco pool, of a striking mosque and the city beyond. Rooms are spacious and businesslike with large desks, flatscreen TVs, and Broadband. Think grey and cream pastels with textured fabrics and dark-wood cabinets. Free WiFi is available in public areas. Bathrooms come with separate bath and shower. Upgrade to one of the Horizon Club rooms and you’ll get (among other benefits) express check-in, free breakfast, afternoon tea and cocktails in the Horizon Club and, thoughtfully, a complimentary clothes pressing on arrival. There are dining options aplenty – eat at the open-kitchen SATOO overlooking the pool, nibble on Italian at Rosso, or nip down to the basement for a nightcap at the always packed and heaving B.A.T.S where ultra-glam ladies and stylish gents swirl about the floor undulating to the music. BATS can get packed on a Friday evening so get in early to bag a place. SATOO is the sort of place that effortlessly combines tranquil family evenings with a brisk breakfast pace as businessmen scuttle in and out. The hotel is brisk and busy, a popular spot for meetings - many of these held informally at the tall-pillared lobby lounge with its signature Shangri-La scent and plaster wall carvings of tropical birds - and fashion extravaganzas. For health buffs, there’s a fitness centre, tennis courts and a putting green. Staff at Shangri-La are delightful – the kind that will chat as they serve. Service here is, well, like at home. Unsurprisingly, Shangri-La scores well on our Jakarta business hotels review though it lacks the architectural elan of some newer entrants. It is a versatile lodging that has something for everyone. The Shangri-La Residences offer long-stay guests similar services, but in an adjoining building. The 253-room DoubleTree by Hilton Jakarta - Diponegoro (doubletree3.hilton.com) serves up meetings facilities, an outdoor pool for an evening refresh and three restaurants. The hotel is not far from Plaza Indonesia, where more entertainment and food offerings are to be had. The meeting space at the hotel spans a generous 1,400sq m with seven function rooms and a ballroom that can handle up to 800 persons cocktail style. Aryaduta Hotel Jakarta (www.aryaduta.com) is an ageing five-star hotel that was once managed by Hyatt. 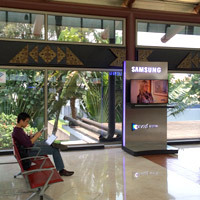 The hotel is a five-minute drive from Gambir railway station. 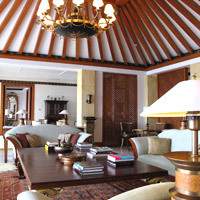 There are around 325 rooms and suites furnished with an Indonesian touch, neat, with a light woody feel. They come with satellite LCD TV, free WiFi, minibar, and a safe and range from 32sq m (Superior) up to 40sq m for a Deluxe. The hotel caters for those in town for business with its meeting rooms, boardroom and business centre. There is an outdoor pool and a gymnasium. An attraction is the competitive price with low season rates from about US$75 inclusive of the 21 percent service charge and tax. Heading southeast from the city centre, the celebrity-laden 20-year-old Four Seasons Hotel Jakarta (www.fourseasons.com) did the unthinkable, and relocated in June 2016 - with 125 luxury suites designed by Cesar Pelli - to ultra-mod Capital Place, a mixed-use development in the Kuningan financial district at Jalan Jend. Gatot Subroto. Bronze cast stick figure musicians greet you at the entrance along with soothing water features, smooth river stones, and the barrage of security now de rigueur at Jakarta hotels. As with developments in this area, traffic can be a challenge while at times, you could breeze through to the city centre in 15 minutes. Capital place is roughly halfway between Dharmawangsa in the far south and the central Grand Hyatt, itself becalmed by traffic at a busy roundabout. At first glance, the high-rise reflective glass hotel is extraordinarily bright and welcoming of light. The high ceiling marbled interior adds to this as you enter past diamond-pattern iron doors to have your senses assailed by a huge floral bouquet at the bottom of an arrow-straight staircase (leading to The Salon function room), and signs pointing to the instantly accessible Palm Court with its soaring ceiling and ‘sea anemone’ chandeliers; Le Patisserie with its colourful doll’s house look and striking black and white geometric marble floors; the darkly inviting Nautilus Bar; and the rust-and-cobalt clubby seating of The Library. Each outlet is just a few paces away from the other, eliminating the need for lifts and laborious steps. 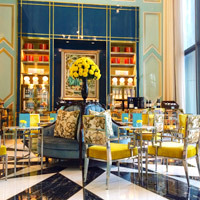 Perhaps unsurprisingly, the lobby is overrun at times by the young and restless, many of them from China, squeezing in a bridal shot or a selfie with a dainty cuppa. There is complimentary WiFi so you can be out dazzling friends on Facebook in no time at all. It is a riot of stimulation for smart-stepping bankers, Ermenegildo Zegna-suited corporates, and weekend trippers and families – the hotel makes a big play for leisure travellers – that stay here. When you’re reoriented, walk past the ivory white wooden walls to a somewhat campy concierge desk with a painted fan background. The reception is tucked away just behind. 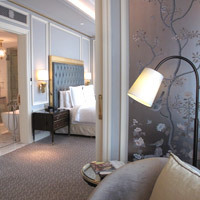 A 65sq ft Premier Suite (there are two per floor) is the pick of the rooms with feminine interiors featuring white wraparound French windows, grey marble foyers, white cupboards, pastel grey walls with white skirting and adornments, white cupboards with gold trim, delicately painted silver wall panels with birds and flowers, comfy seating, puckered velvet divan and elegantly slim black work desk with two three-pin electric plug sockets and data ports. One three-pin plug socket is at either side of the invitingly plump white bed and there are two flat-screen TVs to enjoy. An old fashioned classic clock sits by the bed near press button light controls below a grey leather headboard. The bathrooms serve up marble floors set in a herringbone pattern, twin vanities, a rain-shower and bright lights. There is no peekaboo window looking into the bedroom so bathe and shower – or sing – in privacy. Suite numbers ending in 06 (like 1906 etc) offer grand and green views over low-rise residential areas. Also expect a resorty alfresco pool, a stylish luxury spa (with hammam) and 24-hour fitness centre. The Four Seasons Jakarta has 1,807sq m of event space for meetings and more (the ballroom is 701sq m) so it is a very worthwhile pick for offices in the vicinity and for others planning a weekend chinwag. This address manages to somehow blend a lively Toulouse Lautrec Moulin Rouge palette with its unrestrained joie de vivre in the lobby with a whisper quiet yet lush French boudoir feel in the rooms. It has the makings of one of the best Jakarta business hotels and should slowly overcome any hurdles the new location presents. Best available rates may range slightly lower than at central district hotels like Grand Hyatt and Keraton. Opened March 2015 in Kuningan the chic 173-room Raffles Jakarta (www.raffles.com) is housed in the gleaming multipurpose Ciputra World 1 complex with its Lotte Shopping Avenue (with acres of duty-free), Ascott Kuningan Jakarta serviced apartments for long stays, and the innovative Ciputra Artpreneur gallery, theatre, and museum. It’s a buzzing corner and with Ciputra 2 and 3 in the pipeline this is destined to become quite a hub. Yet, given Jakarta’s unpredictable traffic, the area has variable speed of access. No matter the mayhem on the roads, Raffles serves up an astonishing confection to attract the punters – DBS Bank Tower is part of the grouping already with a captive audience – and it is certain that anyone walking into its cavernous minimalist cream marble vault of a lobby will pause to marvel, and perhaps shoot a selfie, most likely in front of the giant ceiling-high wall mural at the far end, constructed out of thousands of small glittering coloured tiles. It is part fairy tale, part casino hotel, part haute couture design, and it is nothing like the classic sola topi colonial Raffles you may be familiar with in Singapore. Raffles Jakarta is unrelentingly contemporary with arty flourishes galore from the whimsical pulse-quickening lobby level Writers Bar – with its tall cylindrical chandeliers that resemble rocket trails, wall-to-wall art, high-back chairs in cream and brown, and a white grand piano – to the sole restaurant, Art’s Café that links into the mall where a rash of eateries beckon. It may surprise or titilate, but it will make an impression, and the rooms, with butlers on rails, are sumptuous yet minimalist and sober with pastel tones, blue patterned carpets on wooden floors and spoiling marbled bathrooms. Soaking tubs offer city views – while the city gets a view of you – twin vanities are available as well as a decent rain shower cubicle with a civilised seat for well soaped bottoms. 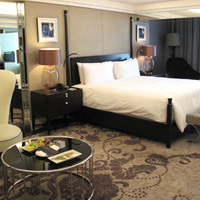 A Raffles Room weighs in at 60sq m with a Garden View Suite at 136sq m. WiFi is complimentary. Expect two flat-screen televisions (one for the living area), flat laptop friendly safe, blue paintings, modern décor, pale wood panels, cream marble floors and a multimedia hub at the desk. One international three-pin plug socket is affixed at either side of the bed. A pillow menu is available for stressed road warriors and that trademark shoeshine service. A large freeform alfresco pool on the 14th floor is a huge plus along with the surrounding palm trees, the Raffles Spa, fitness centre, and 350m of jogging track. At the spa, après massage, enjoy steam, ice, and cold jets, followed by a long flop on a tiled ‘hot’ chair. This bit of sculpted stone exudes refreshing heat for the back and limbs as you gaze out over the red-tile rooftops of Jakarta. There are six treatment rooms for wellness workouts while the fitness centre also provides a 25m outdoor lap pool. Also expect tennis courts, children's pool, yoga space and Jacuzzi. The Dian Ballroom offers 2,500sq m of open unobstructed space for small corporate meetings, bigger conferences and grand Jakarta MICE events, weddings and gala banquets. All in, if you can pull your jaw back up and don your coolest shades, this is one of the top Jakarta conference hotels picks and a snappy business address. Bring your selfie camera and pirouette on the delicately inlaid cream-on-cream marble floor before pausing for a click on the maroon carpet. Speak softly. Like Grand Central Station – though quite sparsely populated – it echoes. Just a tad farther afield and still in the Golden Triangle, Mega Kuningan Complex is a large and striking commercial development. A couple of the biggies, JW Marriott and Ritz-Carlton, are located here, as well as some of the finer apartment blocks in town. The Spanish-run Gran Melia Hotel Jakarta (www.melia.com) is another local resident, with a distinct exterior and interesting design angles inside. In the 400-plus renovated rooms and suites, expect flatscreen TVs, WiFi, minibar, alarm clocks beside the bed, safes, see-through bathroom partitions and ikat-style streaky carpet designs. Bathrooms have separate shower and tubs. Red Level Rooms offer access to additional facilities at the 14th floor club with express check-in and check-out. Guests are spoilt for choice on the dining front – as many as five restaurants are on hand to suit all tastes from cool and casual by the pool to fine dining, Japanese or Chinese. There is ample space to do business with 12 meeting rooms with the 352sq m Legian Room hosting 310 persons for a cocktail. Round off the day with a swim in the outdoor pool or try the gym or the spa. 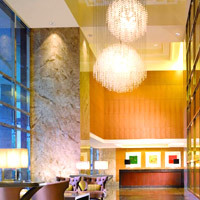 JW Marriott Jakarta (www.marriott.com) is an all-mirror reflective glass affair. Opened in 2001 in Mega Kuningan, it was one of the two hotels targeted in the July 2009 blasts (the other was the Ritz-Carlton) that caused external damage. Once your car or taxi makes it through the lift-bonnet and open-door searches by stern security men, you’ll be greeted with a mix of modernity and elegant homeliness. A café outside the lobby is a pleasant place to while away some time reading the paper or studying the doormen, who appear to greatly enjoy opening doors for a steady stream of business people. The 333 rooms are warm-toned in yellow gold hues, light and spacious with glass-topped desks, flat-screen TVs, fast Internet, and safes that will handle a laptop. Bathrooms are also spacious with separate bath and shower. Executive Floor guests get access to a private lounge (with lovely views) and a butler service. 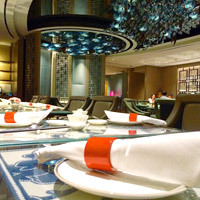 Dining choices include Japanese at Asuka, Cantonese at Pearl or the popular and extensive buffet at Sailendra. A pool and fitness centre will satisfy exercise cravings, and be sure to get knuckles popped and hamstrings pummelled with an Indonesian massage at the spa. Diagonally across the road (and linked by an underground tunnel from JW) sits The Ritz-Carlton Jakarta, Mega Kuningan (www.ritzcarlton.com), it's grand facade the target of the 17 July 2009 blasts. Security is understandably tight but smiling and unintrusive. The reflective glass tower is set above a pillared classical base in cream, dripping with marble and stylish accents. The service is extremely welcoming and brisk. The rooms are spacious and wonderfully decadent with high 3.5m ceilings, large 55-inch flatscreen LED TVs, 300 thread count sheets, large safes, floor-to-ceiling windows, brisk and complimentary WiFi/Internet, Asprey bath toiletries, large marble bathrooms (also with TVs and soaking tubs). Aimed squarely at business travellers and slick corporate meetings (the Grand Ballroom can handle 900 guests), the hotel also runs the group's signature Ritz Kids programme offering child-friendly facilities and experiences. An attractive outdoor pool beckons along with a splendid fitness centre, a luxury spa, and jogging track. The hotel is elegant, sophisticated and European in style; with perhaps a more austere corporate feel than its sister property across the road. The Ritz-Carlton Club on the 26th floor is a subdued black-leather red-chair space with a chess set, library, billiards, workstations, complimentary pressing of five items on arrival, and complimentary use of the club meeting room for two hours per day. The restaurants at The Ritz-Carlton Mega Kuningan offer contemporary at LOBO and regional fare at ASIA. Meeting facilities are also shared between the two Marriott properties, so if you run out of room at one there is the option of going across the road. Despite the traffic snarls, this is a solid Jakarta business hotels choice and one that has picked up top reader awards on our past annual polls. Not far from here on Jl. H.R. Rasuna Said Kav is the soaring Gama Tower that welcomed The Westin Jakarta (August 2016, www.westinjakarta.com) on its higher floors from 50 to 69. Touted as the 'highest hotel in Indonesia' - though 'tallest' may be more appropriate, the SkyLobby is perched on the 60th floor with amazing views of the city. The 272 Hirsch Bedner designed rooms (averaging 56sq m) are bright and contemporary in pale yellow-gold pastels with pale-wood walls and see-through bathrooms. A corner 68sq m Renewal Room is our pick with floor-to-ceiling windows across two walls and a 55-inch smart TV. Expect a spa, a spacious WestinWORKOUT fitness studio with a view and TechnoGym wizardry, and a 200-capacity top floor banquet space for flashy events. Meeting spaces at the hotel range from an intimate 32sq m to 1,100sq m for up to 1,200 guests. And at the end of all that there's your in-room Heavenly Bed. The swanky The Ritz-Carlton Jakarta, Pacific Place (www.ritzcarlton.com), in Sudirman is the second Ritz in the city with a boutique feel and personalised service. Its 62 rooms are vast and surprisingly homey with flatscreen TVs, large safes, floor-to-ceiling windows, complimentary Internet, as well as large bathrooms, also with flatscreen TVs and top-drawer amenties. The hotel has one of the biggest ballrooms in Jakarta with space for 2,400 guests, additional meeting rooms, an Executive Club, a spa and health club, as well as tennis and basketball courts. It also has direct access to Pacific Place mall (with a bustling array from Hard Rock Cafe to Hermes, Prada, Timberland, Nike, and the delightfully named Fook Yew for bubble tea) and Jakarta’s Stock Exchange. There are one, two and three-bedroom suites for long-stay guests. Grand Club rooms start at a huge 72sq m and go up to 83sq m for an Executive Grand Club. Suites offer 127sq m or more of rumpus room. Le Meridien Jakarta (www.lemeridienjakarta.com) is on Jalan Sudirman, distinctive from the road with its blue and white exterior. It’s directly opposite the World Trade Centre, another major business block. This hotel has a unique style with an emphasis on Javanese furniture and art. The lobby is bright and breezy with windows looking through to the pool, rock and water features, blue columns, oversized Javanese paintings on the walls and a dragon slithering down the banister of the staircase. Two towers house 346 rooms and suites that vary in size from 34sq m to a whopping 180sq m. Somewhat old world rooms feature flatscreen TVs, WiFi, dual-line telephones and navy blue carpets with white speckles. Bathrooms are spacious with separate bath and shower. Royal Club guests get access to a smart business lounge with meeting facilities and a tasty afternoon tea buffet. If you’re feeling extravagant, you could spend a fair bit more for the jaw-dropping penthouse. The “Rumah Kudus” is a traditional Javanese palace house covering two floors. It is made from exquisite, intricately hand-carved teak wood with two bedrooms (one with a four-poster bed), and traditional Indonesian furniture. It is quite a sight, even for culturally-fatigued Asian eyes and makes for a spectacular address. There are several restaurants and bars at Le Meridien – sample the meze at one of the better Lebanese restaurants in Jakarta or rendezvous at ‘Le Rendez-Vous’ in the lobby. The pool and garden area provides peace from the traffic outside, while the spa has enough treatments to please the fussiest of spa goers. 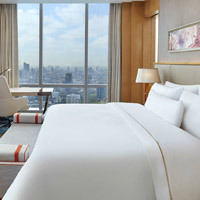 An interesting Jakarta business hotel at a value price is the HARRIS Suites fX Sudirman (fx-jakarta.harrishotels.com). Centrally located on Jalan Jend Sudirman in Senayan, this funky hotel’s 147 rooms and suites are roomy and bright with the signature HARRIS orange tones visible throughout and bright striped carpets. The staff is friendly, and the hotel offers a slew of facilities and services to keep pinstripers happy connected. Expect spacious rooms with free WiFi, phone, hairdryer, inroom safe, flatscreen TV, characterful orange flip flops and even aromatherapy oils. Guest will have access to a small pool, gym and tennis courts. Since its located right inside the fX Sudirman Mall, there’s plenty of dining options too. Grab a room on the top floors to get a good view of the city. Close by is the AYANA Midplaza Jakarta (rebranded on 1 April 2017 from the InterContinental Jakarta MidPlaza, www.ayana.com). The old hotel catered largely to the Japanese market and has set its sights on a broader market mix. It is very corporate in style with rather plain, if adequate, rooms tossing out all too many woody walls, softened by carpets and flatscreen television distractions. The Ayana Suite ups the ante with black marble flooring, patterned wall fabric, Chinese dining table sets with ornate carved chairs, and deep leather sofas. The focus is on Sunday brunches, healthy bites (Blue Terrace cafe) and international fare at Rasa. 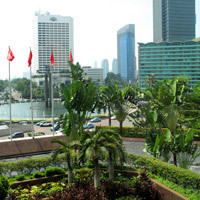 The Sultan Hotel & Residence Jakarta sits on a vast green complex once managed by Hilton. It was very popular in its heyday and attracts mixed reviews now though this locally-managed hotel has inherited spacious well-kited rooms (Grand Deluxe at 45sq m and roomy Executive Suites in a mixed colour and fabric apartment style), and good facilities. Expect a large alfresco pool and other swimming options, an extensive kids' playground, a spa, tennis courts and a convenient jogging track. As a residential focused property it is quite a child friendly hotel with a prized location on Sudirman. It also has some of the most flexible prices for a hotel of this size and room rates may start at around just U$65 in the off season. North of the Golden Triangle, just past Merdeka Square near the Presidential Palace and the National Museum, is a nice mid-size hideaway. Alila Jakarta (a long innings since May 2001, www.alilahotels.com) has a pared-down look with wooden floors in the lobby and neutral toned furniture. This theme continues in the 200-plus rooms, with easy-on-the-eye parquet floors, clean undisturbed walls, large windows, and minimum fuss. The 53sq m Executive Suites serve up a dash more colour with plum divans and square leather easy chairs. In-room expect flatscreen LCD TVs, WiFi, a mini-bar, coffee-making facilities, a safe that will fit a laptop, as well as DVD players in the larger suites. There is a small outdoor pool, a fitness centre, and the Alila Spa with treatment rooms that are large enough to fit groups. This is a designer hotel that is unfussy and smart and can manage small corporate meetings too with aplomb. 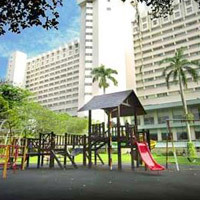 The Millennium Hotel Sirih Jakarta (www.millenniumhotels.com) is located south and slightly west of the national monument in the district of Sirih. Its 400-odd rather basic rooms - with dark wood beds and dark wood room skirtings - offer large LCD TVs, Internet and WiFi, coffee and tea-making facilities, and a minibar. Computers (with Internet access) and fax machines are available in the business centre; there are 17 meeting rooms and a ballroom for events or conferences. Not a huge choice of dining options here – there is just the one Indonesian and Chinese restaurant plus a bakery. There is a pool and garden area that is occasionally used for weddings. Farther up along Jalan Thamrin near Merdeka Square and convenient to embassies and businesses located all along this busy main drag, is longtime four-star workhorse Sari Pan Pacific Jakarta (www.panpacific.com), an all-enduring 18-storey, ancient. The hotel has 400-odd rooms that are on the smaller side, with a Standard weighing in at 30sq m - plain and neat in white and pastel with wooden cabinets, beige carpet, iron, Internet, pillow menu, and a 42-inch flatscreen LCD TV. Borobudur children's playground / photo: hote. Deluxe Club rooms offer navy blue carpets while 60sq m Pacific Floor Rooms offer views from all-white rooms with navy blue carpets and ivory-cream sofas. It is an elegant ensemble for a hotel touching 40 years. This is an old timer with enduring appeal and attractive rates (starting at US$80). It had rocking bars and a disco at one stage but has toned down the action with a good spread of Japanese aqnd Asian foods. Also in the area is the three-star ibis Jakarta Arcadia (www.ibis.com), with compact and clean standard rooms from US$35 up, free Internet and TV with various channels. Ibis has several properties in Jakarta offering simple, workable rooms and limited facilities. Just to the east of the National Monument and a short walk from the Presidential Palace, occupying 23 acres of land, Hotel Borobudur Jakarta (www.hotelborobudur.com) is one of the bigger and most storied city hotels with 690-odd rooms, suites and serviced apartments. It was once home to the InterContinental marque. The lobby is a grand affair with a sweeping staircase and plenty of marble. Rooms are spacious secure - each floor has a gated electronic card entry. They feature coffee and tea making facilities, Internet, flatscreen TVs , safe and a minibar. Expect bright colours, patterned carpets, woody furniture and plenty of red and gold. Much larger Junior Suites have a separate lounge area, bedrooms with an en suite bathroom, fax machine, and complimentary WiFi and Internet. They feature the signature red head wall with the inset stone bas-relief. The spacious and toned down cream pastel Club Suites are our pick with their homey touches including deep sofas, large flatscreen televisions, and paintings with large white borders and gilt frames. Train like an Olympian in the Olympic-sized pool, sharpen your racquet skills on one of the three squash courts or eight tennis courts, or sweat up a storm on the running track. Pilates and yoga classes are available at the fitness centre. There is a good kids' playground outdoors, a spa for tired limbs, and a helipad for the rich and famous. Polo Ralph Lauren has an inhouse store and Garuda maintains a sales office on site as well. There is a vast array of cuisines from Japanese and Chinese to Italian with the added allure of the Churchill Wine and Cigar Bar. Hotel Borobudur Jakarta is a much favoured spot for official events, corporate meetings for as few as eight or a gala function for 3,000. It offers flexible conference space and works well as a MICE venue given its scale, large manicured grounds, and huge room inventory. Interestingly, this is both a very child-friendly Jakarta hotel as well as a conference hotels pick. 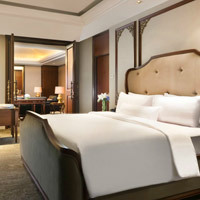 Moving southwest is the huge and grand Indonesian-owned Hotel Mulia Senayan - Jakarta (www.themulia.com). With over 990 rooms, it is certainly not small, and its busy and extraodinarily plush lobby reflects its muscle and appeal. Here you'll also find its exclusive The Suites at Hotel Mulia Senayan Jakarta for an all-suite luxury Jakarta hotel experience. Mulia is in a splendid location for offices in the Senayan area (shared by The Ritz-Carlton Pan Pacific, though not adjacent to it), and is also handy for Senayan Golf Course, which it overlooks. A Mulia Singature Room serves up 48-inch flatscreen LED TVs, 400 thread count linen to pamper the most discriminating of traveller bottoms (think Princess and the pea), high speed Internet and WiFi, plush fabrics, rich wood cabinets, and ivory-pearl sculpted head boards, bathrooms slathered in the finest marble and a Japanese electronic potty with enough controls to fly a small plane. Think rich interiors, texture fabrics, classy lamps, and palm fronds. Those in Mulia Executive Rooms get access to the Executive Lounge, which offers benefits such as complimentary green fees at the nearby golf course. There are ample meeting facilities (two ballrooms and 17 function rooms), 10 restaurants and bars (including the pulsating CJ's Bar that opens 9pm with its crowds of dancers, revellers and preening women), a well equipped fitness centre, spa, and swimming pool. The Grand Ballroom is one of the largest event spaces in Jakarta at 2,500sq m and can host a crowd of 4,000. This makes the Mulia one of the best Jakarta conference hotels with great MICE venues in stylish surrounds. 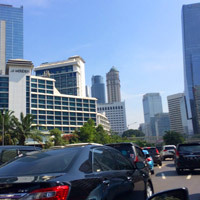 Not far from the Jakarta Convention Center and the Indonesia Stock Exchange, the Fairmont Jakarta (opened January 2015, www.fairmont.com) is also conveniently connected to the Plaza Senayan shopping mall and office tower. This makes it a good bet for both leisure and business stays though the chances are you will be an executive suit in need of Fairmont's signature brisk service and amenities that include 380 rooms with skyline views, 108 Sky Suites that range up to 128sq m offering excellent long-stay options in a residence style set-up with kitchen and dining area, afternoon tea at the Peacock Lounge, the Willow Stream Spa, and 3,500sq m of meeting space including a 1,200sq m ballroom for MICE and more. In-room expect timber flooring and darkly corporate woody tones, flat-screen television, long working desks, often with a fabulous city view, and cream furniture. It is stylish and functional. The Kemang district in South Jakarta is a quaint residential area that is popular among expats, with boutique shops, good restaurants and a couple of interesting hotels. Kemang Icon (www.kemangiconhotels.com) is one of them. Formerly managed by the Alila brand, it’s a small Jakarta boutique hotel serving up only 12 rooms. But what it lacks in size it makes up for in quirkiness. Rooms offer home theatre systems, iPod docks, DVD players, large LCD televisions and free WiFi. Think a heady combination of industrial chic and smart designer lines in open plan rooms. Bathrooms are all-white affairs with free-standing bathtubs and good toiletries. The hotel is chilled out and homely, despite the idiosyncratic design. The rooftop pool and bar area is an excellent spot to wind down after a hard day’s work. This was a great hotel when it launched and is slowly rediscovering its earlier form. 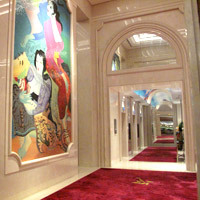 The Grand Kemang (www.mesahotelsandresorts.com), with 203 rooms, is an older hotel that opened in 1974. It has been through several makeovers to end up in its current guise, which has an urban contemporary edge. Larger rooms are textured with wooden floors, large black or white sofas, frosted glass panels, and lipstick red space-age armchairs. Deluxe rooms are plainer with Indonesian touche and a Grand Deluxe Queen is in pastels with bright red armchairs. Watch for the new 311-room InterContinental Jakarta Pondok Indah (late Dec 2018, www.ihg.com/jakarta/), the new muscle in the south with a touch of contemporary class and lots of premium shopping access. There's a golf course not far away too for a weekend swing and the hotel is set up for conferences and meetings with a ballroom that can hold up to 3,000 guests cocktail style (standing). In a quiet residential tree-lined street in South Jakarta’s Kebayoran Baru is a most elegant and understated address that is easy to miss, hidden behind traveller’s palms and lush foliage. Stepping into The Dharmawangsa Jakarta (www.the-dharmawangsa.com) you’ll be forgiven for thinking you’ve stepped into a home rather than a hotel. Arrive through a classic pillared porte cochere then blink and adjust to the dim light as your body starts decompressing and the pulse slows down. Indonesian artefacts adorn the walls and rooms like sombre museum displays, yet in the hushed wood-marble-and-silk environs there is no architectural arrogance as at many snazzy new hotels, just a beaming welcome and sophistication in spades. The Dharmawangsa is uniquely Indonesian, proudly so, and it blends into the neighbourhood’s low-rise mansions with an endearing reticence. Don’t expect glitz and glamour, but rather subtle flourishes – gamelan musicians in the lobby, fresh jasmine flowers or orchids in the rooms, and huge smiles. This is as far from contemporary that you can possibly get, and it is a refreshing change. Yet, Wi-Fi is complimentary in rooms and restaurants and springs on in an instant – albeit not in the lobby – without any need for hair-pulling registration and passwords. With just 99 rooms and suites - all designed in five Indonesian styles: Javanese, Balinese, South Sumatran, East Indonesian and Pesisiran (North Javanese) – the service is hugely personal with 24-hour butlers gliding about, beaming, to do your bidding. They turn up, arrange things, and disappear. Recurring design motifs – like the surya (sun) orb inlaid into the floors – are from the Majapahit dynasty, a brief but glorious period when the kings of Java repelled the Mongols and ruled the seas. The hotel also has two residence towers around the compound and two more are planned. Hotel rooms are vast with 66sq m of stretch space and somewhat masculine in their simple décor, with tall herringbone-wood doors, huge private balconies, large bathrooms featuring rare yellow Italian marble, twin vanities with brightly lit mirrors, a tub, and power-shower cubicle – there’s no rain shower but you’ll enjoy getting to know the antique tramcar lever that controls the water. Hot water arrives reasonably fast. Quality toiletries are aplenty, as is old-fashioned soap, and the small but feisty hairdryer gives a good account of itself when plugged into the basin side cabinet. The large firm bed rests in front of an olive-grey silk head wall – with two small lamps, one at each side – and a large tan carpet underfoot. There is a classic clock behind the bed but no master switch. Remember, this is a residence so switch lights on and off at your convenience. There is no point wasting electricity. This is one of the most likeable aspects of the room design that makes you feel instantly at home. It would be useful to have bright reading lights at the bed and also at the large work desk. But then there’s always the balcony – looking down over the central lawns and swimming pools, rich with birdsong – for books and newspapers. Three pin international electric sockets are a rarity but one can be found at the Webber coffee machine near the bar where a beer will set you back around US$6. Other plug points are the European-style deep hole two-pin round variety. A sofa and coffee table take up the far side of the room, facing the bed. The old Elsafe is a small jewellery box affair and won’t accommodate a laptop though, in truth, the days of hiding prized notebooks are over; and the small SONY LCD television in the side cabinet is being upgraded to a 50-inch behemoth in new-look rooms where the lounging divan now sits at the foot of the bed, also facing the wall-mounted screen. A larger 55-inch television will greet you at the 443sq m Presidential Suite on the 9th floor with its soaring wooden beams that link up at a point just above the chandelier, slim plunge pool, immaculate symmetry, and large standalone soaking tubs. You could spend days here, just perched by the pool on a cream sun lounger, being pampered at the Bimasena Spa (that occupies a separate building with an indoor pool, fitness centre, table tennis and squash), or in The Library reading a book or sipping on one of the best chocolate martinis east or west of the Suez. A signature spa treatment and massage will set you back just around US$44. If you really need to leave, there are classy chauffeur-driven wheels on hand. Lounges and restaurants are refined – try Sriwijaya Restaurant for fine French-inspired Indonesian cuisine, the Majapahit Lounge for afternoon tea, the Jakarta Restaurant for international or Asian fare with a nice alfresco section for breakfasts, or the well stocked and clubby Wine Cellar. Dharmawangsa is easily among the best Jakarta business hotels and, despite its 20 odd years, punches well above its weight. It is excellent for small corporate meetings, grand dinners, weddings and leisurely hideaway weekend ‘staycations’ with the kids. Pick it for work (the central district is a 30-minute drive), pleasure (shopping at Pasaraya with designer brands and family-friendly stores from Bally to Kickers Kid), nightlife (bars, clubs and eateries at Block M), or as a relaxing residential choice for long stays in Jakarta. With best available rates running higher than at other city hotels this is a spot for discerning travellers looking for something very different. The hotel has been recognised by Smart Travel Asia readers as a TOP 25 Hotel in Asia. It is a hard won and well deserved accolade. 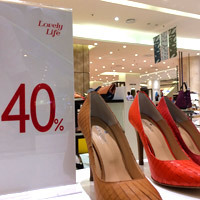 Shopping is a popular pursuit for well-heeled Indonesians. And this is certainly reflected in the number of Jakarta shopping malls that are sprouting regularly. They are virtually everywhere. And some of them are very upscale indeed. Expect to see all top designer brand labels here though these may be scattered based on pricing and focus of the department store. Hotels like Grand Hyatt and Keraton are directly linked to Plaza Indonesia, a busy mega Jakarta shopping mall in the heart of the city packed with restaurants and fashion goodies from Louis Vuitton, Tiffany jewellery and Chanel to DKNY, Charles & Keith shoes and Marks & Spencer for just about anything in a looser fit. You will find everything here from Starbucks coffee to sizzling steaks. A bit away in the emerging Kuningan area is the glitzy multipurpose Ciputra World 1 complex with its Lotte Shopping Avenue (with duty-free) and the Ciputra Artpreneur venue for exhibitions and events. Spot upscale brands, mid-range stores and more restaurants than you can shake a stick at. The Lotte Duty Free downtown store is open from 10.30am to 10pm. 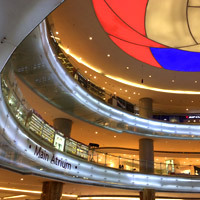 Lotte has over 170 brands for your perusal in 5,500sq m of space. Expect a VIP lounge too. Think Kiehl's, LAB, Guerlain for skin potions and creams (there's a Korea Beauty Zone too), or browse COACH, Bally, TUMI, Breitling, Burberry, BVLGARI, Armani and more. Senayan City (www.senayancity.com), part of a development that includes apartments and offices, has dozens of shops and restaurants, as does Pacific Place (www.pacificplace.co.id) by The Ritz-Carlton where you'll find the elusive Ermenegildo Zegna and a range of quality brands from Under Armour and Louis Vuitton to Victoria's Secret. Plaza Senayan (plaza-senayan.com/) next to the Fairmont offer Bally, Sergio Rossi, Longchamp, ALDO shoes, Dunhill, Kate Spade, LV, Thomas Pink, Bulgari, Cartier, The Body Shop and Hokkaido Baby. This is again a big shopping mall with constant activity and events. Farther south, not far from the Dharmawangsa there's shopping by the acre at Pasaraya with its stock of designer brands and family-friendly stores like Kickers Kid. Also trawl Block M in the same neighborhood. For computer stores and electronics, head to Mangga Dua mall (tel: [62-21] 601-7771). Moving away from the giant malls, Jakarta bargain shopping is at its best at Tanah Abang Market in central Jakarta. Trawl here for the cheapest prices for jeans, T-shirts, and casual trousers. If in the mood, head to Jalan Surabaya, a flea market in Menteng. Bargain hard. Ancol to the north has cheap clothes for kids but this can be a bit of a hike when the traffic is backed up. Pick carefully and choose your time. There’s always that traffic to contend with. Room rates may be subject to a combined 21 percent service charge and government tax unless stated otherwise. Several hotels offer promotional rates especially during the monsoon season from October to April. Expect to pay from US$70 for a mid-range business property to US$150 for an international brand and US$200 and above for luxury five-star hotels. The exchange rate is around US$1=Rp13,500. Pick up a copy of NOW! Jakarta, available in several hotel rooms, for the latest goings-on and dining tips. Ascott Jakarta. 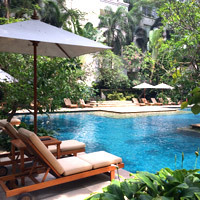 Tel: [62-21] 391-6868, (www.the-ascott.com). Ascott Kuningan Jakarta. 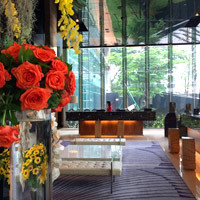 Tel: [62-21] 3006-0288, (www.the-ascott.com). Alila Jakarta. Tel: [62-21] 231-6008, (www.alilahotels.com/jakarta). Aryaduta Hotel Jakarta. Tel: [62-21] 23521234, (www.aryaduta.com). AYANA Midplaza Jakarta, formerly InterCon. Tel: [62-21] 251-0888, www.ayana.com). DoubleTree by Hilton Hotel Jakarta - Diponegoro. Tel: [62-21] 3190-4433, (doubletree.hilton.com). Fairmont Jakarta. Tel: [62-21] 2970-3333, (www.fairmont.com/jakarta/). Four Seasons Hotel Jakarta. Tel: [62-21] 2277-1888, (www.fourseasons.com/jakarta/). Gran Melia Hotel Jakarta. 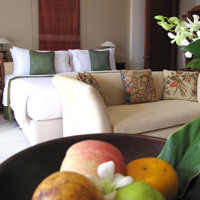 Tel: [62-21] 526-8080, (www.granmeliajakarta.com). Grand Hyatt Jakarta. 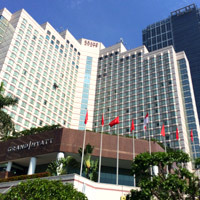 Tel: [62-21] 390-1234, (www.jakarta.grand.hyatt.com). Grand Kemang. Tel: [62-21] 719-4121, (www.mesahotelsandresorts.com). HARRIS Suites fX Sudirman. 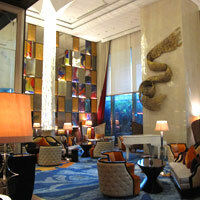 Tel: [62-21] 2555-4333, (fx-jakarta.harrishotels.com). Hotel Borobudur Jakarta. Tel: [62-21] 380-5555, (www.hotelborobudur.com). Hotel Indonesia Kempinski. Tel: [62-21] 2358-3800, fax: 2358-3801, (e-mail: reservations.jakarta@kempinski.com or www.kempinski-jakarta.com). Hotel Mulia Senayan - Jakarta. Tel: [62-21] 574-7777, (www.hotelmulia.com). ibis Jakarta Arcadia. Tel: [62-21] 230-0050, (www.ibis.com). JW Marriott Jakarta. Tel: [62-21]5798-8888, (www.marriott.com). Kemang Icon. Tel: [62-21] 719-7989, 719-8968, (www.kemangiconhotels.com/). Le Meridien Jakarta. Tel: [62-21] , (www.lemeridienjakarta.com/). Millennium Hotel Sirih Jakarta. Tel: [(62-21) 230-3636, fax: 230-0880, (e-mail: sales@millenniumjkt.com or www.millenniumhotels.com/millenniumjakarta/). Raffles Jakarta. Tel: [62-21] 2988-0888, (www.raffles.com/jakarta/). Sari Pan Pacific Jakarta. Tel: [62-21] 2993-2888, (www.panpacific.com). Shangri-La Hotel, Jakarta. Tel: [62-21] 570-7440, (www.shangri-la.com). The Dharmawangsa. Tel: [62-21] 725-8181, (www.the-dharmawangsa.com). The Keraton at the Plaza, Jakarta. Tel: [62-21] 5068-0000 (www.luxurycollection.com/keraton/). The Westin Jakarta. Tel: [62-21] 2788-7788, (www.westinjakarta.com/). Pullman Jakarta Central Park. 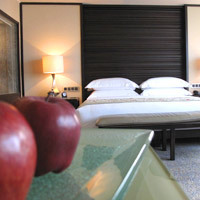 Tel: [62-21] 2920-0088, (www.pullmanjakartacentralpark.com). Pullman Jakarta Indonesia. Tel: [62-21] 3192-1111, (www.pullmanjakartaindonesia.com/). The Ritz-Carlton Jakarta Mega Kuningan. Tel: [62-21] 2551-8888, (www.ritzcarlton.com). The Ritz-Carlton Jakarta, Pacific Place. Tel: [62-21] 2550-1888, (www.ritzcarlton.com). The Sultan Hotel & Residence Jakarta. Tel: [62-21] 570-3600, (www.sultanjakarta.com/).